On my last full day I made it to two destinations: the Jim Thompson house, and Wat Arun, a temple on the river. The Jim Thompson house was the house of one Jim Thompson, an american who settled in Bangkok after the second world war. He apparently became interested in the history of Thai silk making, and the further production of cloth from that silk. He was apparently instrumental in re-starting production of silk, and of silk products, using craft workers in Bangkok. In the following years (basically, the 1950s) he built himself a house near the location of his workers, and lived there. The house is actually made up of several old teak-built wooden houses, brought to the site from other parts of Thailand, altered, and put together to form a new and quite large structure. It’s located not far from the overhead railway so I was able to get there easily. 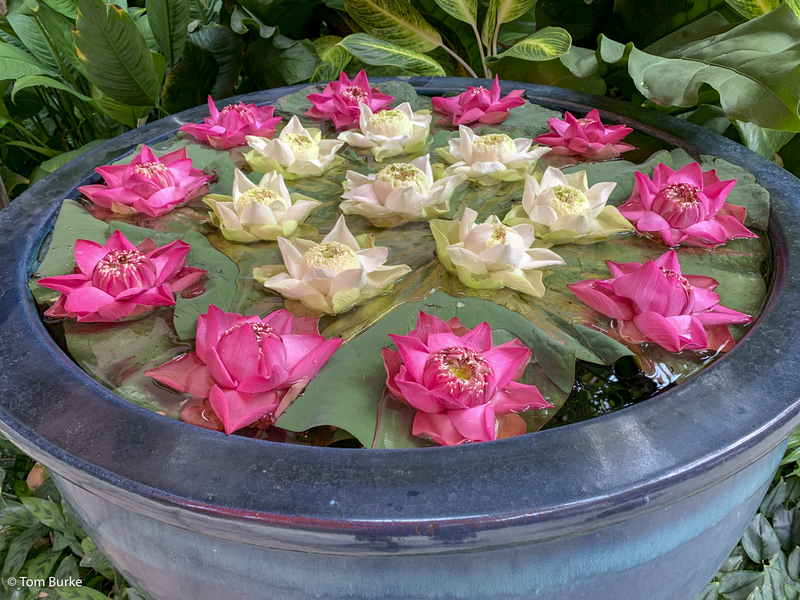 I had been looking forward to the visit – the Jim Thompson house is highlighted in many guide books – but I was disappointed when I discovered that it takes the form of a guided tour of the house lasting maybe 40 minutes or so. There’s no opportunity to explore or indeed to revisit any rooms that you’ve already passed through. I suppose that’s unavoidable; there were a lot of visitors, and while the house is a good size it’s still a domestic house, so it would be impractical to have people wandering around in all directions. (At least with a guided tour all the visitors are moving in the same direction….) 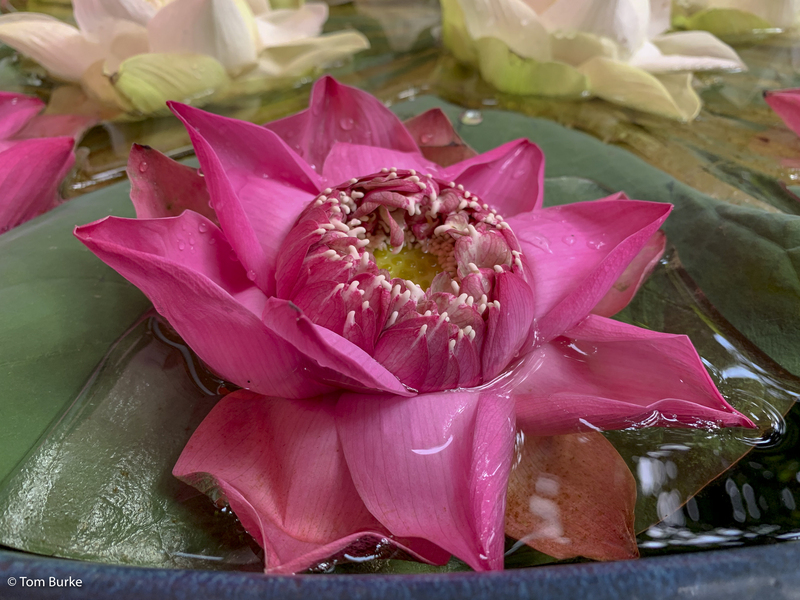 It’s also the case that the house is furnished and decorated, and on the walls are many apparently rare and certainly beautiful Thai objects, and again with a guided tour visitors are under the eye of a guide all the time. More disappointingly, photography of the house interior is not permitted. So this was not the experience I’d been looking forward to. The house itself is characterful and attractive, and the objects on display are beautiful and fascinating; I would have loved to be able to explore at my leisure – but not so. In fact, on the way out I think I found the actual point of the place – a Retail Opportunity! There is a Jim Thompson Foundation shop, in which various items made from Thai silk can be purchased – at a price. For example, over-the-shoulder tote bags started at just above 4,000 Thai Baht, and went up from there. At just about 40 Baht to £1, that’s a starting price of £100. To be fair, there were cheaper items, e.g. scarves and silk squares, but it was the bags that caught my eye – they were beautiful. Anyway, here’s a link to their website to give you a feel for the full range of their goods, and the prices (in €). During the afternoon I visited Wat Arun, a Buddhist temple on the river. It takes the form of a Stupa – a sort of tower, with various outlying sub-towers. You can climb so far up it but not all the way – which I was glad of, as the steps are steep and in places a bit dilapidated. This was interesting and dramatic, but very, very hot – this was mid afternoon, the sun was out, and there were quite large crowds. The queue on the pier for the tourist boat back was especially hot, but while it was uncomfortable there were no real problems. Once I was on the boat things improved a lot – indeed, it was on this boat ride that I took a lot of images in the previous post. In the middle of the day – i.e. 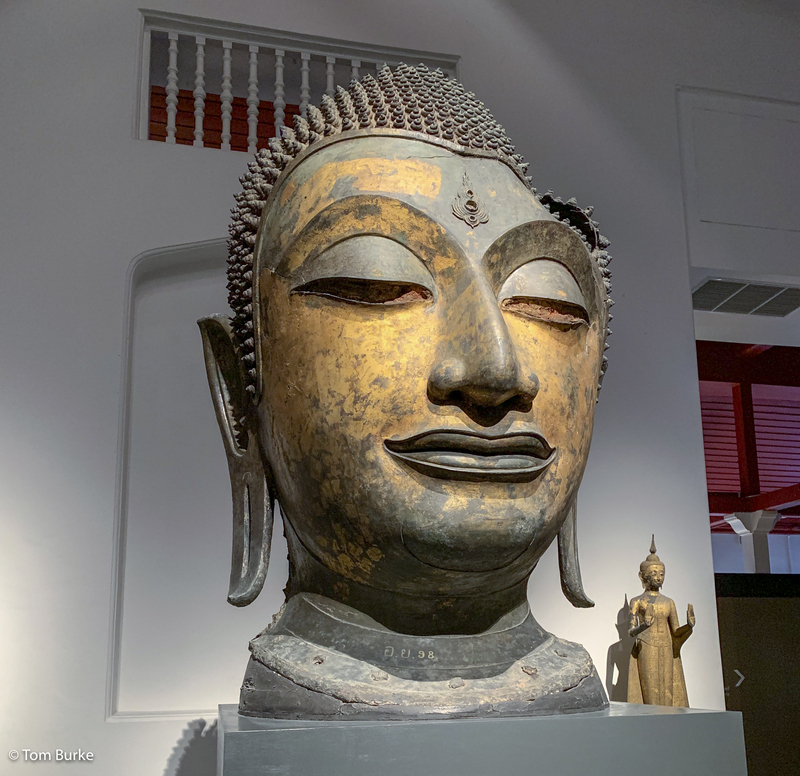 between the Jim Thompson House and Wat Arun – I made an impromptu visit to an arts centre in the middle of Bangkok, and in many ways that was the best part of the day. I found a photo exhibition by a member of the Thai royal family – images taken on her travels in 2018. (I have a feeling that this is an annual exhibition; after all, who in Thailand is going to say ‘No’ to a Princess?) The quality of the images was varied, but all were attractive. The internal architecture of the building was stunning – it was on about 9 floors with a huge open atrium – and it had cafes, etc, on the first couple of floors. So this was where I had my lunch that day, in lovely air-conditioned coolness! So all in all, not quite as good a day as the previous two. But I still enjoyed the river boat ride and the Arts centre, and although the visit to Wat Arun was hot, the architecture was stunning. And that was my visit to Bangkok! I was up before 5am the following morning in order to get to the airport for a 9 o’clock flight to Dubai. Once I was there I embarked on P&O’s Oceana for a 10-night cruise around the persian Gulf, and you can find a summary post from that, and links to detailed posts, in my Cruise blog, here. I’ve mentioned the river in a couple of other posts, but this one will major on it and provide some images. Running broadly north to south, there are many historic or religious sites on the river, or very near to it. It seems to be the main highway for the older part of the city, and in addition to the river itself, there are a number of canals leading off it that connect into the deeper parts of the city. I gather that formerly there were more canals, and travel by boat along the river and/or the canals was the main way of getting around. In recent decades, and especially during the building frenzy of the 80s and 90s, a number of the canals were filled in and either built over or converted to roads – my previous post shows some of the results of that! Nonetheless, the river itself is still a transport artery with boats of various types running up and down it. These seems to fall into several different categories. There are some basic passenger boats, often only running in the early morning and again during the late afternoon/early evening which serve the needs of local people getting to and from work. Then there are some older, smaller boats that operate as water-borne delivery trucks. As expected, there are large, more comfortable (and more expensive) tourist boats, collecting passengers from the main access points and connecting them to the tourist sites all along the river; there are some very large boats dedicated to evening dinner cruises; and finally, a more recent development has been the appearance of smaller boats operating as shuttles for the luxury hotels and other developments along the river-side. The architecture varies as well, from beautiful and well-maintained historic or traditional sites, to run-down older spots, to modern high-rise developments; and often these are are in startlingly-close juxtaposition. For my second full day I visited the National Museum. This is housed in another former palace not far from the river, and not far from the Grand Palace. Getting to it involved the by-now usual ride on the SkyTrain and then a boat up the river. The museum could best be described as ‘eclectic’ – the collections of objects are very varied. Most of them are housed in old buildings of the former palace, and each collection room holds objects that are thematically linked. For example, there’s a huge building that holds the Royal Funeral Chariots and their various appurtenances – whenever a leading member of the Thai royal family dies there’s an elaborate funeral ceremony and their remains are conveyed on one of these chariots. (Which chariot is used depends on their status within the royal family.) Then there were displays of weapons and warcraft; puppets, and puppetry paraphernalia (puppet dramas were apparently a leading art form within the court); and old textiles and garments. There’s also a new gallery showing artefacts, mainly statues and sculptures, from pre-history down to recent times. Many of these are statues of the Buddha, in the various ‘attitudes’ that are regarded as correct. The statuary all originates from sites that might be described as ‘Greater Thailand’, but also display attributes that reflect whichever culture (Thai, Khmer or Burmese) was predominant in that part of Asia at the relevant time. I spent perhaps three hours wandering around the museum, and enjoyed it greatly. In contrast to the visit to the Grand Palace the previous day, this site was not especially crowded; in deed, at times I was alone in front of a display. The highlight was being able to visit the Buddhaisawan chapel. Like other Thai religious sites, the decoration, ornamentation and craftsmanship on display is extraordinary. This time I was able to get a picture – photography was not prohibited. I found this day easier than my first full day. It was no less hot, but I was better able to cope with it and keep going. It was easier to ignore my discomfort, if you like. On my first full day I visited the Grand Palace and Temple of the Emerald Buddha. This was the home of the Kings of Siam from the 1780s to the early 20th century. Unfortunately, the day I was there the halls of the actual palace seemed to be closed – at least, I couldn’t find any way into them. But the Temple of the Emerald Buddha and all the associated shrines, statues, etc, were open so I concentrated on them and just walked through the palace grounds later. First, though, a few words about getting to the location, and my first impressions of Bangkok. 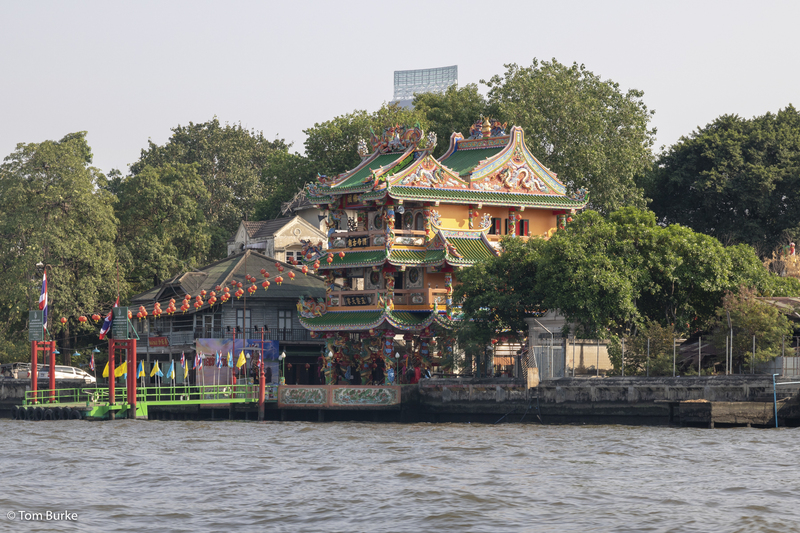 The site is close to the Chao Phraya river, which runs along the western side of the main city. The river is very wide and busy, with boats of all descriptions running up and down it and calling at a large number of piers on both sides. 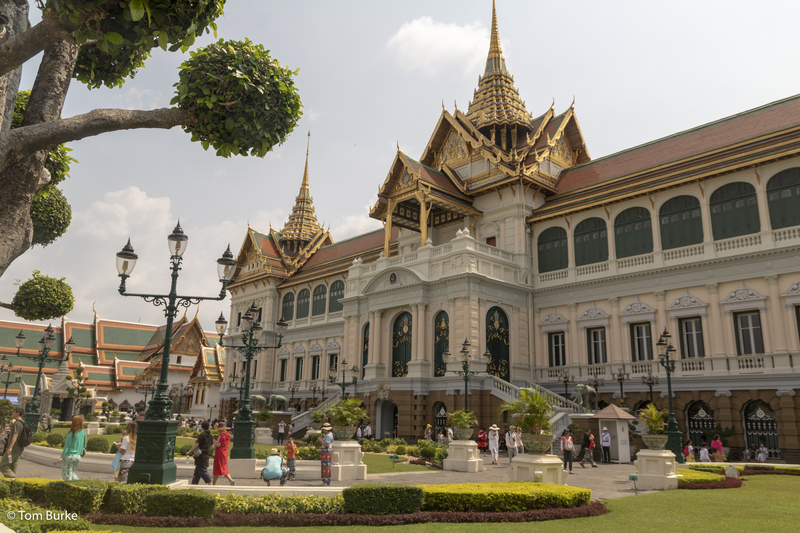 There are many traditional and historic sites along the river – various temples and other sites, including the Grand Palace (which actually sits a bit away from the river, but not far). Included in the various boats was the ‘Tourist Express’ boat, and this was the one I used. But I had to get to the river first, of course, and it turns out that there’s a SkyTrain station at the main pier on the river. (In fact, of course, it’s the presence of the SkyTrain station that’s made that pier the ‘main pier’.) The SkyTrain is an elevated railway with two separate lines. It’s modern, clean, and blissfully air-conditioned. This was important as Bangkok was very hot all the time I was there – 35° every day, and no lower than 27° or 28° in the evening. I’ve just had a short holiday in Bangkok; just four nights, which gave me three full days. This was in the context of a longer holiday which included a 10-night cruise from Dubai on P&O’s Oceana. The few days in Bangkok were before the cruise, and you can read about the cruise here, in my Cruise Blog. As usual on my trips to Asia I flew with Emirates from Manchester, which gives me the opportunity to break up the journey with a transfer at Dubai. This does extend the overall time from about 13 hours to 17 or 18, but I think that being able to stretch my legs for up to three hours at Dubai airport does me good – I’m really not sure how well I’d do with a non-stop flight of 13 hours or so. So I was on a flight from Manchester at 1:30pm on Monday 4 February, arrived at Dubai at just after midnight local time on the 5th, boarded an onward flight to Bangkok at about 3am and arrived in Bangkok at around 1:30 pm, local time. As ever, the flights were long and boring, but thanks to the comforts of Emirates’ A380 aircraft were not too not too uncomfortable; and being able to have a break between the two flights was definitely a good idea. I stayed at the U Sukhumvit hotel in Bangkok. This is a four star hotel in the Sukhumvit area of downtown Bangkok. I found it good in some respects but not so good in others. The good points were that it was competitively-priced, the staff were friendly and helpful and there was an excellent roof-top pool, bar & restaurant area where I took most dinners. The room was a good size, was clean, and pretty much everything worked. The bathroom especially was very good, and there was plenty of storage. However other aspects of the room were rather uncomfortable. I could never quite get it cool enough, and generally felt a little warmer than I really wanted to. Secondly, there was no chair or table, just a high work surface under one of the windows, and to sit at this there was a high stool. I just wanted a simple chair that I could sit in and plant my feet on the floor! The hotel’s location was a bit mixed as well. It was up one of the lanes off Sukhumvit Road, and it was a 10-minute walk from the main road to the hotel. 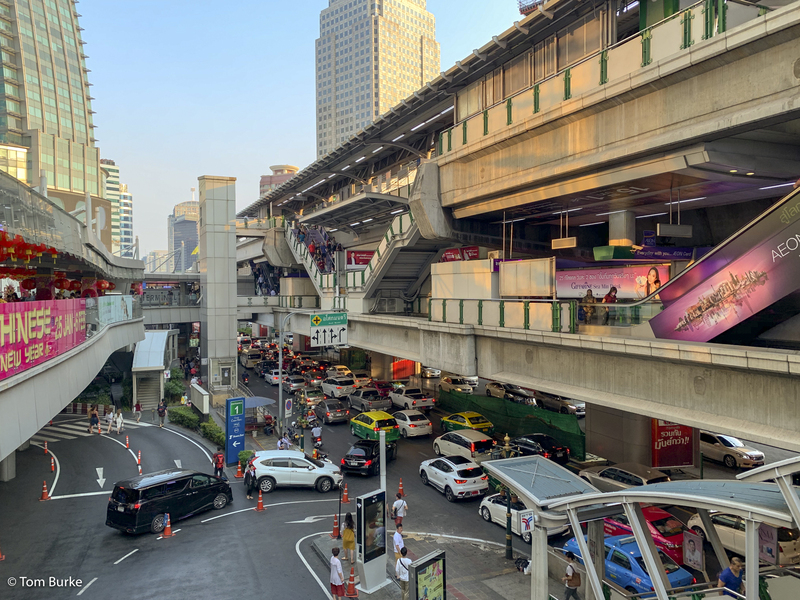 Getting down to the main road was OK, in that the hotel had a free tuk-tuk service on demand to take you there, and once arrived at the road there was a modern mall with shops of many kinds, a station on the SkyTrain elevated railway, and a number of bars and restaurants. The problem came with getting back to the hotel. It was necessary to walk from the main road, and at the end of the day that 10 minutes’ walk seemed very long and hot – especially after enjoying the truly impressive level of a/c on the SkyTrain. But at least being half-a-mile up the lane meant that the hotel was quiet – Sukhumvit Road itself was insanely busy, well into the early hours. So I got to the hotel in the late afternoon on arrival day. After showering and changing, I explored the area, which basically meant going down to the main road, wandering around the mall, checking out the SkyTrain station, and then wandering back to the hotel. I’d had a small meal before I did any exploring, and later had an even smaller meal during the evening. But I wasn’t late to bed that day, after spending so many previous hours travelling.